This is a limited split LP with Sula Bassana (aka Dave Schmidt) from Germany and 3AM, a solo project of Chino Burga from Peruvian psych rock band La Ira de Dios. 3AM has one LP out on Levitation Records but I have not heard that. Sula Bassana, I'm sure, is familiar to our readers! 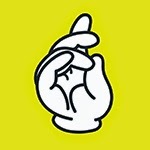 Sula has three tracks on his side (A), starting with the long (10:36) "Disappear". The track slowly builds up but stays in a pretty ambient, mellow state including soft electric guitar, fretless bass, Korg and Moog synthesizers, Mellotron etc. His beloved Komet Lulu also delivers some nice, dreamy and quiet vocals later on (as well as the cover art). A motorik drum beat is added after the seven-minute marker. Wonderful! At under half that long, "Grong" is a cool, rather dark and minimal instrumental. Then we still have the six-minute floating, droney and ambient "Smoof" that is perfect for dreaming and meditating with. 3AM starts off with "Speedway to Heaven" that brings to mind Suicide with its restless beat. Chino uses guitars, vocals, loops and drones on his side to a great effect I got to tell you that. I'm also reminded of Spacemen 3, for example. "Moonrise" has a steady beat going on and lots of psych guitar (fuzz, tremolo..) and Wooden Shjips / Moon Duo like monotonic vocals and psychy solo guitar work. Very repetitive and hypnotic stuff, and I like it! Also "Run Through the Jungle" has a steady, pounding drum beat loop and monotonic vocals but the guitar sound is more 60s psych on this one. Finally, we've got one long (10:24), droney instrumental piece called "Waves" that is made with just guitar I think. There were quite a lot of delays with this LP, and there is also a version with the LP labels being on wrong sides of the vinyl by mistake... A future rarity, perhaps? A very nice album, anyway. Siinai is a Finnish psychedelic/experimental/ambient/trance/electronic/drone/kraut rock band and Supermarket is their second album. They have also released one collaborative album with Moonface on Jetjaguwar. The band features musicians who used to play in the excellent Joensuu 1685. I saw the band's record release gig earlier this year and liked them a lot, and also got a CD copy of their new album to review. Sorry for the delay guys... I also saw them play with Moonface later on, another great night out for me. The almost instrumental album includes eight tracks. First we get the three minute "En-trance", that is more or less a cool, ambient synthesizer intro. On "Shopping Trance" the band introduces the Manuel Göttsching like hypnotic delay guitars and drums, electronics and floating synth sounds. Lovely! Just check out the video... "Aeiouyäö" also has some faint vocals repeating the vocals over and over again. This very pleasant, atmospheric and airy track also has some more melody. The lengthy "Jonotus" ("Queuing" in English) is an celestial, heady ambient drone, and "Prisma" (a market chain in Finland, notice a theme here?) is pretty ambient in nature too but has bit more stuff going on. "Smiling Cashier" gets a little more intense including a hypnotic beat and cool piano and keyboards etc. The ending is just droney chill-out, though. The shorter "Vasikka" has those delay guitars again and percussive drums as well as lots of keyboards and synths. Very nice! The album is finished with the slow and mellow "Exit" as we get out of the strange but pleasant, trans-dimensional shopping center world of Siinai. If you like psychedelic ambient acts like Astralasia and the kraut rock of Tangerine Dream, Ashra and Neu! you will possibly enjoy this album. One of the best releases by Finnish bands this year! I have to say that I've never been a die-hard Kyuss fan even though I like the seminal desert/stoner rock band and also most of the band projects and releases of all the ex-Kyuss members. For this new 2LP/CD/digital release ex-Kyuss drummer Brant Bjork has recruited a really killer backing band and the album rocks in a heavy, groovy, smokey and even a bit funky way. 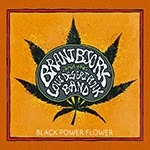 This is definitely the best Brant Bjork solo album that I've heard, and proves that the man still can write great tunes, sing and rock out with his guitar. The first track "Controllers Destroyed" starts of slow and heavy like a homage to Black Sabbath. Soon we get faster stoner rock pounding and I'm excited already. The chorus is great too. I'm reminded of Fu Manchu a bit, and no wonder. What a great opener! I really like the dirty fuzz guitar sounds on this album. "We Don't Serve Their Kind" has a groovy beat and rocks out too. "Stokely Up Now" and "Buddha Time (Everything Fine) get closer to early 70s US hard rock I think, but are still cool, heavy songs. The main verse "Soldier of Love" somehow brings to mind Thin Lizzy, but "Boogie Woogie on Your Brain" is great stoner/desert rock again. "Ain't No Runnin'" is the shortest track on the album at under three-minute in length and has some pretty cool, inventive hooks and riffs. "That's a Fact Jack" is the funkiest track on the album and not bad at all. Then we get some mellower blues on "Hustler's Blues", but the track starts to rock out hard in the end with some great solo guitar. Phew! The last track "Where You From Man" is the longest at 8:12 and also the most psychedelic so obviously my favorite... It has a heavy boogie beat, spacey psych effects on the vocals and some nice jamming. A really good, mind-expanding ending for a great album! Warmly recommended for lovers of hot Palm Beach desert rock. 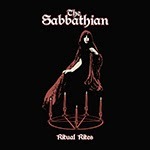 The Sabbathian is a new epic doom metal band in the vein of classic Candlemass and Nemesis. The band features multi-instrumentalist Chad Davis from US occult heavy metal band Hour of 13 and a great Norwegian female singer Anette Gulbrandsen. 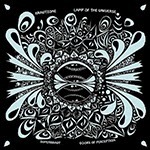 This 12" EP is their first release and includes three tracks that all are in between six and seven minutes in length. "Ancient's Curse" starts off the EP sounding like 80s Candlemass, very heavy and doomy indeed. Anette's vocals make the song stand out reminding me a bit of The Devil's Blood. There's also some great solo guitar work in there, nice! "Ritual Rites" continues along the same, doomy, heavy and slow/mid-tempo path and has some great riffs and excellent, powerful vocals.The last track "Nightshade Eternal" doesn't bring anything new to the table either, but is another very cool, heavy doom metal track in the Candlemass vein with great riffs and vocals and fluent metal solo guitar. After four minutes the track gets faster, though, and offers some great true heavy metal headbanging opportunities. Excellent! I'm looking forward to a full-length release. 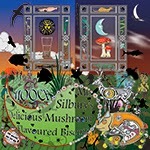 This is the 25th release in 22 years by UK based band Mooch led by Steve Palmer. Steve's style has changed in between ambient, electronic, 60s psych pop, space rock, progressive, folk etc. but this new album, the first to be released on vinyl, is definitely (and luckily, if you ask me!) more on the space rock side, although not heavy space ROCK as we know it. The album features some great quests (Gary Moonboot, ex-Magic Mushroom Band etc., Alex Pym, Dream Machine, Bridget Wishart, ex-Hawkwind etc. and the space rock violinist Cyndee Lee Rule). The almost instrumental album starts off with the rather progressive, very nice "T Minus None" that has some superb solo guitar work and spacey synthesizers. This somehow reminds me of the early Ozrics stuff. My only small complaint is the use of programmed drums once again. "The Golden Rule" has more Tangerine Dream vibes with the cool, hypnotic sequencers and soaring keyboards, and later on the Simon House styled violin really brings the track to life. Excellent! "Mellifluo" has a cool, laid-back, almost jazzy mood and spacey sound effects. Also "Clouded" is very mellow stuff with just some cosmic synthesizers. The very psychedelic and floating "The Great Retsina Jam" is one of the highlights and again features lots of great synth work as well as some acoustic instruments, for example. "Pstrings" starts off with a short piece of cool vocoder stuff and a groovy beat, and soon we'll also get some very nice, elegant solo guitar work by Alex Pym and of course spacey synthesizers and sequencers. The album is finished with "Another T A P", that has an electronic, pulsating beat and also very nice, mellow vocals by Bridget. I think I can hear some of Steve's ethnic instrument collection in the background, but synths and keyboards are in the front. This is a very nice ending for a great LP, now can I have some more of those biscuits, please? It always saves my day when the postman brings me the latest issue of the Hawkwind fan magazine Hawkfan. Issue 41 comes with a quite different cover where you are supposed to find the surnames/second names of 43 musicnauts and 1 fanzine publisher from the letter grid. Cool! This time Brian Tawn concentrates on the 50th birthday celebrations of Hawkwind frontman Mr. Dibs, Hawkwind's Bedford Corn Exchange concert on 30th September 2014 and an eleven-page Damnation Alley, where he this time goes through the recent vinyl reissues. Oh joy! As always, the mag is a true labor of love and written in a very warm, intimate and lovely style. There are 24 pages, some cools pics, all in black and white as always. Those who are familiar with Hawkfan know what they will get and if you are a fan of Hawkwind you definitely should check this out. Price, including postage, £1.80 within the UK, £2.80 the rest of Europe and £3.50 elsewhere, by Paypal to briantawn@aol.com. Yuri Gagarin, named after the famous Russian cosmonaut, is a great new heavy space/psych rock band from Gothenburg, Sweden. 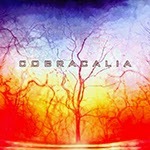 This debut album was originally released last year on a local label. The sound quality wasn't the best possible, so Sulatron released this remixed, much better sounding version this autumn. People really seem to dig this band since the vinyl version is already sold out! Well, I can't blame them since this is killer album. It's still available on CD, though. The album includes just four, instrumental tracks but they are long... "First Orbit" starts off suitably with some space transmissions in Russian. The actual track begins after a while and we get some heavy guitar, hypnotic, repetative mid-tempo rhythm and space effects. This is like a mix of Loop, Farflung, Hawkwind, Monster Magnet and White Hills, I'd say and very good indeed. "Sonic Invasion 2910" is a bit faster and rocks out even more. With some Tommy Grenas vocals this would sound very much like Farflung, but the track is so trippy, heavy and groovy and includes enough of nice solo guitar so things keep interesting even without the vocals and with more or less just one simple riff. This will for sure make you bang your head! "Za Kosmosom" is a slower, but just as heavy piece that reminds me of some of the slower, meditative and not too freaky tracks by Acid Mothers Temple. It has a bit mystical atmosphere and I like it a lot too. 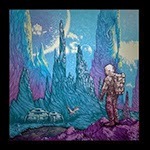 I'm also reminded of The Spacious Mind, another excellent space/psych rock band from Sweden. The last track "The Big Rip" is the longest at 10:47 and is superb, fuzzy and phased heavy space rocking from the beginning until very close to the end before the track evaporates into cosmic space sounds. This is perhaps the most Hawkwind-like piece on the the album, but there are also some stoner rock influences in there I think. I really like the solo guitar work, once again. I hope this superb band will release more stuff soon since I just can't get enough of music like this nowadays. Be sure to check them out! 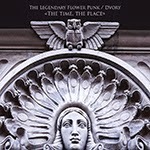 This CD/download release is a collaboration of two Russian experimental duos: The Legendary Flower Punk and Dvory. These friends got together for a studio jam session on 21st of September 2014 at Boiler Records studio (St.Petersburg), and the end result is one, over 60-minute-long improvised track including two guitars, trumpet, keyboards, noises & percussion. The whole piece is very minimal and ambient in nature, and you really have to focus to truly notice all the little nuances and variations that are going on. The trumpet is playing quite an important role at times playing little melodies or giving a more freak-out free jazz vibe. The guitars keep a steady but light riff going on in the beginning, but later on the track almost evaporates into the ether. You really have to listen carefully but when you do, this is actually a very enjoyable and psychedelic experience. It's better to turn up the volume, dim the lights and relax, and just let the these weird soundscapes take you away from your normal reality. Try it, it's worth it! You can download this for free but please support the artists if you can. This is a second split release by this rather active Russian progressive, heavy and a little bit psychedelic fuzz rock/metal band The Grand Astoria. First came the split with the excellent US Christmas a couple of years ago, and now they have teamed up with Montenegro from Argentina. Both bands deliver one long track for this CD. 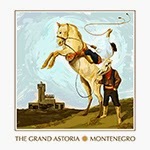 The Grand Astoria's "The Body Limit" was recorded in Tallinn, Estonia in February this year. It starts off with some tranquil, gentle guitar and bird-song, and grows slowly when some slow drums, quiet female singing, bass and lead guitar gets added. The mood remains the same although the track gets more intense until around the 12-minute-marker when it turns into pure metal and Kamille, the guitarist/singer starts to sing. Then we get weird, some more psychedelic instrumental passages with delayed guitar. The next vocal part reminds me a bit of some of the progressive metal bands like Queensrÿche, so if you're into that kind of stuff you'll like it. Then the track gets faster for a while, but then we get some more atmospheric stuff and the almost 30-minute track ends in a beautiful, mellow way. This is a rather massive, varied track, that's all I can say. Phew! I got to admit that I've not previously heard about the band Montenegro from Buenos Aires, Argentina. The label Sick-o-Delic Records is also from Buenos Aires, and through their web site I was able to find some information, and what little I could understand the band was formed in 2009 and has released one full-length on the the label before this split. It's good to see that there is at least some kind of psych/stoner underground in Buenos Aires at the moment. The 18:40-long track "El Matadero" starts off with slow, fuzzy blues jamming, and in three minutes we get some laid-back vocals in Spanish. I like the chilled-out mood of this song, and the psych guitar work is pretty good as well. Before the ten-minute-marker the boys start to rock out in heavy stoner rock manner, and then some more progressive, experimental stuff follows. There's a weird, acoustic, almost classical part with some spoken word (the speech of Juan Manuel de Rosas on his rise to power at Buenos Aires government, 8th December 1829). I'm not sure how well that fits in, but then we get some fast and heavy blasting until the end. I'd like to know what this song is about, but at least matadero means a slaughterhouse and I guess the track is based on an important short story with the same name written by Esteban Echeverría in 1839 but not published before 1871 (according to Wikipedia). A pretty cool track, anyway. 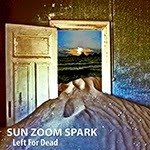 This album started already in 2001 when John Galuska (ex-Cesare's Dog) asked Sun Zoom Spark guitarist/vocalist Eric Johnson to help create music for a larger concept idea called Left for Dead. Galuska wrote poems around the subject of death and renewal as well as recorded hours of abstract sound collage for the project. The members of Sun Zoom Spark then one night recorded a full hour of psychedelic improvisation but then the project was shelved for 13 years. This spring Johnson revisited the recordings doing editing and overdubbing the material since he found it was too good to really left for dead... And the end result is pretty stunning! 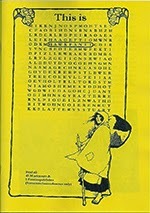 There are 12 tracks on this CD featuring three shorter, minimal and experimental tracks ("Transmissions I, II & III") and also a couple of over ten-minute-long pieces, a prototype of "Jewel of the Seven Stars" that was later recorded for a Black Sun Ensemble album and the great, closer to 17-minute progressive and varied title track of the album. Three of the other tracks are in between eight and nine minutes in length, as well. Most of the stuff in pretty slow and atmospheric and some of it has Pink Floyd vibes, the mellow eight-minute jam "Left for Life" in particular. There are lots of psychedelic sound effects and synthesizers, which is always a good thing if you ask me... "Masterpiece by Midnight" is a little more upbeat and groovier. "Volcano" is sort of heavy blues, I guess, but also rocks out. The album is finished with the airy and nice "Return to Swim". This is a very nice album that works best on headphones in nocturnal chill-out sessions with your eyes closed and mind open. 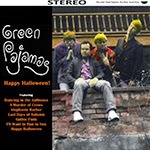 This 77-minute CD includes the second, VERY limited (just 10 copies...) The Green Pajamas tape Happy Halloween! from 1984 released on CD for the first time. In addition to the eight tracks from that release there are 13 other tracks that the boys recorded on tape recorder in the basement rehearsal place around the same time thirty years ago. The three first songs have been previously released ("Thinking Only of You (Lust Don't Last)" & "All I Want to Do" on Goar EP #8 and "In the Sky" on Lee Jackson in Space compilation), but the ten other tracks are previously unreleased. Some of the songs have been later re-written/re-recorded and released on other albums, but these are the first versions and definitely capture the original spirit of this excellent psych pop/folk band from Seattle. The band uses vocals, electric and 12-string guitars, bass, drums, primitive percussion, Casio keyboards, cello and clavichord and the music already has that distinctive vibe and sound that makes The Green Pajamas so special. You can sometimes hear clear 60s influences (from the likes of The Beatles or The Byrds), but they already had something unique going on and I really enjoy listening to this CD. All the stuff is coming from cassette tapes from Jeff Kelly's drawer and had some problems in the first place, so just don't expect spectacular sound quality, although Tom Dyer from The Green Monkey has done a great mastering job. Especially the Happy Halloween! songs (tracks 4-11 on the CD) present the darker side of The Green Pajamas (apart from "Dancing in the Jailhouse", perhaps), but there are also some happier moments in there, for example "Thinking Only of You (Lust Don't Last)". Most of the songs are relatively short, but there are a couple of longer ones as well, like the last actual track "This Winter's Night" recorded just before Christmas in 1984 with some friends joining in on chorus. After that there's still an unlisted surprise "cover track"... In summary, Happy Helloween! CD is a very welcome opportunity to hear all these wonderful songs from years ago and a must-have for any self-respecting Green Pajamas fan.